The universally designed hitch can easily be adapted for mounting onto the bottom or top hitch on the tractor. The hydraulic cylinder on the hitch allows for the entire front part of the wagon to be additionally lifted for easier transfer of forage into a silo. The serial holding plate ensures that shorter fresh, wilted and dry forage is picked up quickly and efficiently. The one-piece conveyor unit with four loaders evenly transports the forage into the cattle farm. 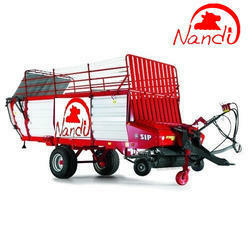 Looking for Self Loading And Unloading Forage Wagon ?